NEC Display Solutions of America, Inc., a leading provider of commercial-grade display and projector solutions, today announced the launch of InfinityBoard, a high-end collaboration tool that elevates the interactive meeting experience with its powerful, yet easy-to-use Mosaic Hub collaboration software, flexibility via multi-platform support, and ease of purchase for enterprise customers. "For customers who need a best-in-class collaboration solution for the modern meeting room, InfinityBoard has everything built-in," said Chris Feldman, product manager, NEC Display. 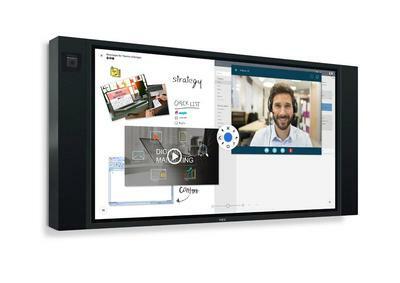 "Out of the box, InfinityBoard includes an integrated in-glass UHD touch display, preloaded collaboration software, custom speakers with a built-in camera, and a powerful Intel i7 OPS slot-in PC. This makes the InfinityBoard one of the most robust, flexible, and versatile collaboration products in the market." The InfinityBoard collaboration solution is designed for corporate and higher education customers and includes an NEC Display UHD display with in-glass touch, with screen sizes ranging from 55" to 86", a Huddly® camera with a 120-degree viewing angle for productive videoconferencing, 40-watt conference speakers, and a passive pen for a natural writing experience without having to worry about charging an additional device. In addition, InfinityBoard features an OPS slot-in PC, and the Mosaic suite of collaboration software that includes video conferencing, messaging, whiteboarding, and wireless sharing functionality. Later updates will further increase capabilities with integrated native support for popular business tools. "The InfinityBoard is the most flexible collaboration solution on the market today," Feldman said. "With the InfinityBoard, customers are not locked into using proprietary software because the OPS slot-in PC offers the user enough power to run the most common business applications. The included Mosaic Hub software offers one of the most intuitive user experiences available today. The GUI is so self-explanatory that even users who have never touched a collaboration display before won't even need to read a manual to use it." The OPS slot-in PC features an Intel® Core i7 CPU, 8 GB of RAM (DDR4), 128 GB M.2 SSD, Dual band wireless 802.11ac + Bluetooth 4.2, TPM (Trusted Platform Module), and comes pre-installed with Microsoft® Windows 10 Professional OS. This ensures the flexibility to install applications as business needs dictate, and allows future performance upgrades without needing to invest in additional hardware. Customers are also able to use their preferred business communication software without being locked-in to proprietary applications. "The InfinityBoard represents the culmination of NEC Display's tiered approach to collaboration technology," Feldman said. "It is the first fully-realized global collaboration solution, which means you can have offices anywhere in the world and be able to purchase the exact same solution for each one." A 1-year subscription to Mosaic Hub is included, and InfinityBoard is backed by a 3-year warranty. Customers also have the option of adding additional equipment including height-adjustable wall mounts and mobile carts for added flexibility. InfinityBoard is available this month with the 3720-INF2-55, 3720-INF2-75, and 3720-INF2-86 screen sizes. The 3720-INF2-65 size will be available in early 2019. For additional information and specs, please contact your NEC Display sales representative or visit NEC Display Solutions.